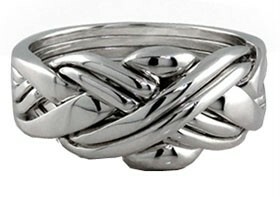 This is one of the most popular and challenging among the puzzle rings. Each piece quality inspected after hand crafted by Master Silversmith. Shipped inside a gift pouch. Available Sizes are 4, 4.5, 5, 5.5, 6, 6.5, 7, 7.5, 8.5, 9, 9.5, 10, 10.5, 11, 11.5, 12.